Amidst increasing alliance concern that the United Kingdom is approaching the point at which ‘little Britain’ may, in military terms, be both perception and reality, the British government has embarked upon a new Strategic Defence and Security Review (SDSR). The auguries aren’t good for Defence, which has already had to find £500 million to satisfy the Treasury. For the defence effort as a whole, the key problem is the need to replace the four Vanguard-class nuclear-powered ballistic missile submarines. This program can’t be delayed without risking the continuous at-sea deterrent, the holy grail of the British deterrent, which has been sustained, albeit sometimes under great strain, for more than four decades. Both the Conservatives and Labour have committed to the successor force, while a number of studies have confirmed that the submarine-borne ballistic missile remains the most effective mechanism for maintaining a nuclear strike capability. What has also been confirmed—to the Navy’s relief—is that there will be four boats, the practical minimum for surety of operational availability. After the scarring experience of the Astute-class nuclear attack submarine program, which suffered the effects of a gap in submarine design and construction, the approach will be conservative, building as much as possible on the Astute experience. The UK will cooperate with the USA on both the missiles and the nuclear reactor, while there will be consultation, as was required with Astute, on detailed design problems. This program lies like a shadow over the conventional forces for two reasons. The first is cost. It will be an impost when all three Services require investment. The second reflects the problems of scale, all too familiar to Australia, with which Britain must now deal. The technical and production capacity of the UK is limited, as is the capacity of Defence and the Royal Navy to provide the expertise required. The demand on human resources will not only be substantial but, given the reductions in recent decades, represent a much greater relative call on the whole than did the two predecessor deterrent force programs. Reducing UK capacity to be a ‘parent’ to different capabilities is something that the British are starting to realise. It’s manifested itself in debates over industry, but all three Services are beginning to understand that they no longer have the ability to generate the back-rooms needed to maintain nationally autonomous support for every force element. The UK will have to work with both the USA and Western Europe to solve this conundrum. The Army may be most in need of a renaissance. The Chief of the General Staff (CGS), General Sir Nick Carter, author of the current ‘Army 2020’ concept, has been arguing for change, particularly to revive ‘a modern general staff’, with the intellectual commitment that this will require. The Army seeks to retain the ‘ability to generate a war-fighting division in an expeditionary context’. The problem is, even with an approved regular ceiling of 82,000 and reserves of 30,000, its ability to generate and sustain such a force is, at best, doubtful. In Iraq and Afghanistan, the Army consistently achieved a much less effective roulement than the Royal Marines. The regimental system in particular has great value instilling esprit de corps, but may have contributed to a less than efficient army structure. There remain no less than 18 infantry regiments, providing 32 regular and 13 reserve battalions, plus six companies (the majority of which are Guards’ units for ceremonial duties). The reserve is also under stress. In part, the last government’s commitment to an Army Reserve of 30,000 was a way of maintaining overall numbers on the cheap. 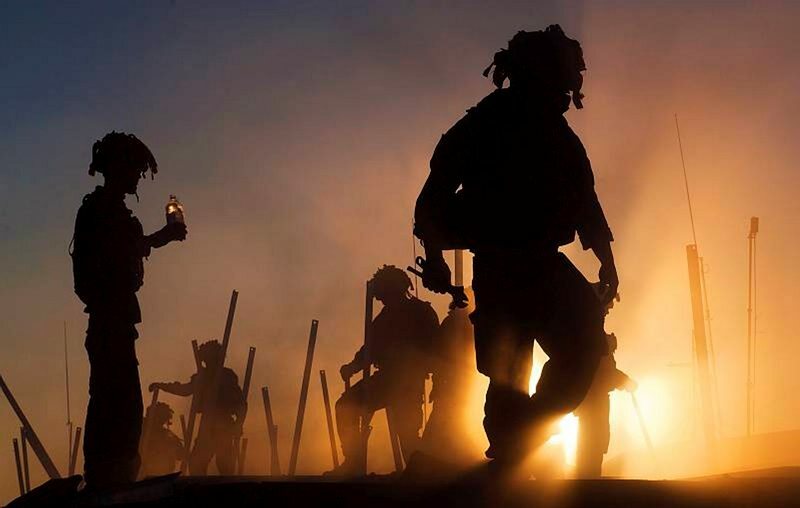 Apart from the fact that the relationship between readiness and resources has never been clearer for land forces, the scheme may be in trouble because of the difficulty of recruiting enough suitable reservists for the infantry. The talented and capable are usually the least likely in a modern economy to have the free time to acquire and maintain the skills required for the combat arms, as opposed to the successful use of professionals such as doctors and lawyers in their specialist roles. Weight may also be in question. The second arm of Army 2020 is an ‘Adaptable Force’ to focus on conflict prevention and international engagement. This will have obvious utility in many contingencies but the difficulty is, whether remaining combat-ready or not, such forces may not be ideal for the higher intensity warfare which state (and some non-state) threats imply. This adds another element to the readiness problem. The reformist CGS may well prefer that the traditional constituency for preserving regiments, strongly represented in the Conservative party, give him room for manoeuvre in exchanging people for equipment, weapons, vehicles and ammunition. The Royal Air Force (RAF) has its own challenges. It’s missing a key element in the absence of maritime patrol aircraft. SDSR 2010 saw the capability abandoned as a cost saving after the effective failure of the modernisation of the aged Nimrod. Following the even more ill-starred Nimrod AEW project, the effort to renew a design half a century old was a good demonstration of the perils of supporting national industry without adequate thought to the alternatives. The MPAs’ removal was intended to be temporary and expertise is being maintained with the help of personnel loans to partner MPA forces, but a replacement has yet to appear. This is apparently a high priority for SDSR2015, as it should be, given increasing Russian activity around British waters and the potential vulnerability of the ballistic missile submarine force in particular. The Air Force also needs to consider its position on the Navy’s new aircraft carriers and the F-35. The original 1998 SDSR concept was for a close relationship between RAF and Navy that would create air groups of sufficient size to be a significant strike and air defence capability in their own right. The RAF’s original view that carrier aviation, if used, had to done properly was one driver in making the two Queen Elizabeth-class the size they are. Financial stresses caused the Air Force to walk back from this—to the point where the maintenance of as much as possible of the land based fighter/strike force became a higher priority than retention of the Harriers intended as the initial air element of the first carrier and the precursor of a powerful RN-RAF F35 carrier air group. It may be time for the RAF to recommit and give the carriers a higher priority than the current intended effort of one RN ‘heavy’ and one RAF ‘heavy’ squadron. At this point, the carriers are likely to deploy with a dozen F-35B, but would be much more powerful signals of British intent—and much more useful in higher intensity and larger scale operations—if they could go close to matching the American concept of 36 embarked fighter/strike. The RN has been discussing the regular embarkation of USMC F35B, but there are complications to such an approach—and the possibility that the Marine Corps’ aircraft may be committed elsewhere. James Goldrick is currently a visiting fellow at All Souls College, Oxford and an adjunct professor at UNSW Canberra. Image courtesy of the UK Ministry of Defence.